Happy Wellness Wednesday! 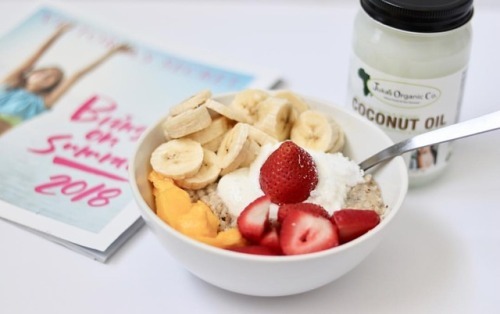 Start your day with a healthy breakfast... – Juka's Organic Co.
Start your day with a healthy breakfast to fuel your body & mind throughout the day. Eating well doesn’t mean eating fancy but it does mean choosing your foods wisely. Our morning breakfast is never boring here at Juka’s Organic. We start of strong daily with some green tea to wake up. Our breakfast is always yum. Oatmeal is a nice choice especially when we can add our favorite fruits like strawberries and mangoes with greek yogurt. Ohh, of course our cold pressed, extra virgin coconut oil is never missing. This adds a tremendous amount of flavor and benefits to the body. By the way did you know that not all coconut oil taste the same? Real coconut oil should taste like fresh coconut at all times. Have the real taste of coconut in our sustainable and ethically harvested 100% natural coconut oil and let your body enjoy the health benefits it offers. Prepare your foods with this cold pressed, extra virgin, cert, gluten free, non GMO️ & no additives coconut oil and we are at Juka’s Organic sure that you will have a finger-licking experience.